PURITY IS EVERYTHING - THIS IS GOING ON YOUR SKIN! This serum is 100% Vegan, 98% Natural & 72% Organic. NO Parabens, NO Sulfates, NO Fragrances! This is the purest form of Vitamin A for your skin that will reduce fine lines, plump up your skin and decrease pore size. FREE E-BOOK - "SKINCARE - Survival Guide"
This is a must read! Jam packed with 50+ pages of information to help you reverse the effects of aging. Filled with illustrations, tips and much more. Valued at 9.95, we'll email this to you within 24 hours after you order giving you time to read it before your product arrives. Our customers love the purity and efficacy of our Retinol 2.5% Serum, but if you are not fully satisfied then we will provide you a full, no questions asked refund - but keep the informative e-book valued at 9.95 as our free gift. 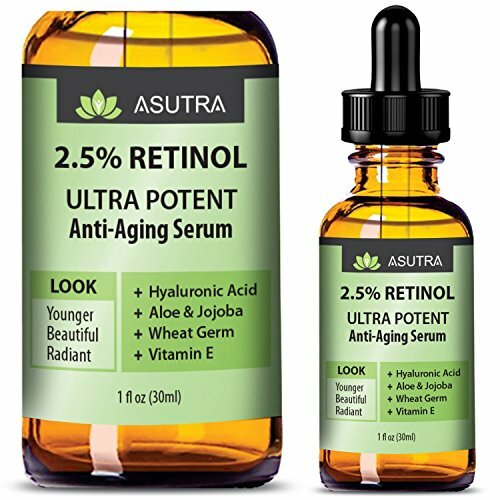 SKIN ENHANCING POWER OF RETINOL: This silky serum penetrates deep and combines a synergistic blend of active ingredients that soften and help heal the skin, smooth wrinkles and soften fine lines. Expect compliments as your skin defies the laws of aging with this powerful retinol serum. SEE RESULTS WITHIN WEEKS - GUARANTEED: Our Vitamin A (Retinol) has a molecular structure that's tiny enough to get into the lower layers of skin where it activates collagen and elastin. Vitamin A is proven to improve mottled pigmentation, fine lines, wrinkles, skin texture, skin tone and color, as well as your skin's hydration levels. TRY IT - if you don't see results, we will refund your money - no questions asked. INCLUDES FREE MUST READ E-BOOK: A 9.95 value. Learn what you can do right now to help reverse the effects of aging. Every person should read this! 50+ pages with illustrations, topics like "anti-aging myths to avoid" & "foods that slow the aging process". We'll email you this e-book right after your order ships so you can actually read it before your serum arrives! IT'S NOT JUST FOR WRINKLES: Retinol helps fade brown spots, giving your skin an even and brighter complexion. It can help reverse sun damage and many of our customers have had great results against acne and other skin blemishes. Attain and maintain that youthful glow within weeks. DERMATOLOGIST RECOMMENDED - IT WORKS: Retinol is probably one of the most important ingredients you can add to your skincare regimen. It's not only good for anti-aging properties but also used to just maintain a healthy, even skin texture and tone. We took that one step further by infusing it with some of the most important anti-aging ingredients like antioxidant rich WHEAT GERM and concentrated HYALURONIC ACID to retain the skin's natural moisture. Premium Vitamin C Serum for Face, Anti-Aging Topical Facial Serum with Hyaluronic Acid + Vitamin E, 1 fl oz. Vichy Minéral 89 Daily Skin Booster Serum and Moisturizer, 1.69 Fl. Oz. Joyal Beauty 100% Pure Best Hyaluronic Acid Serum for Face Skin Eyes Lips. Anti-aging Hydrating Original Organic Hyaluronan for Topical Use. Daily Deep Dermal Hydration. Ranked Number 1 HA. 1 oz.